One of the best things about a chalkboard wall is how you can just doodle it up whenever the feeling takes you and then you just wipe it away. Since I’ve had my chalkboard wall in the kitchen, I’ve used it for spooky Halloween decorations, a big Thanksgiving turkey mural, and birthday banners for my kids. Christmas came and went and I used it for quotes from Elf and songs, along with a huge Christmas tree we ‘decorated’ with one drawn ornament every day to count down to Christmas. So a fresh new year means fresh new chalkboard paint ideas. This time, I wanted something on my wall that I can’t get where I live – a palm tree. And because I’ve been into white lights all over the house lately, I wanted to light it up so it glows whenever I see it. I can’t build the perfect sunny, warm tropical oasis in the house, but I can try. 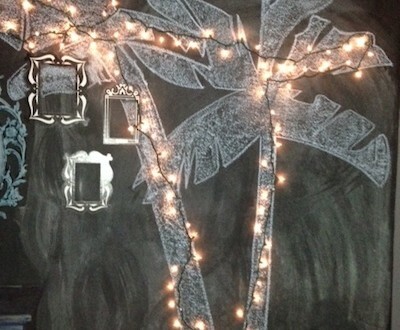 Here’s a shot of my chalkboard wall palm tree. All you need is some chalk, a sketch to copy, and a string of white lights. Use pins to put up the light string and viola, you have a palm tree in your house too. 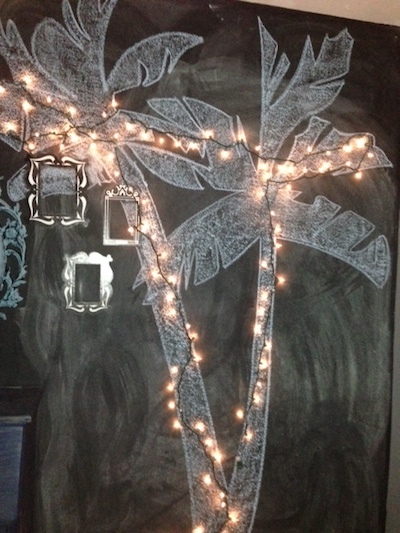 Seasonal Use For Chalkboard Walls! !